A well-deserved honor was bestowed on Harlee Donovan as she was named the (first-ever from SOU) national player of the year. 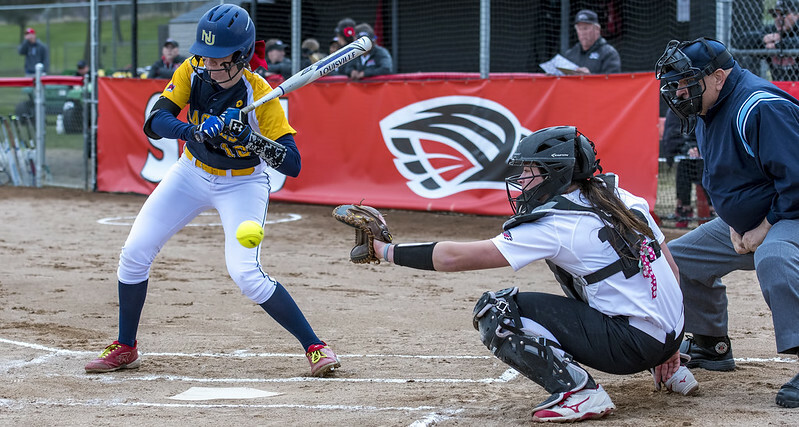 Besides her gold-glove defense at catcher, she was by far the most feared hitter in the NAIA. This is evidenced by her 62 walks, more than 20 as many as anyone in the NAIA. By way of comparison, her OPS of 1.364 is more than 200 points higher than Babe Ruth’s 1.164–the highest in MLB history. The leader in OPS this year in MLB is Mookie Betts at 1.187. Kelsey Randall was an All-American for the second year in a row. She came in third in the NAIA in walks (with 40), was first in triples, first in runs scored, and second in stolen bases. On defense she was also first in assists and won four gold gloves as a Raider. She is the all-time record holder in the NAIA in triples. Harlee Donovan applies the tag for the second out in a row at home plate, helping to preserve an SOU victory on Tuesday. Posted on April 13th, 2018 under only in ashland, people. Tags: harlee donovan, Raider Athletics, softball. Comments Off on Gameday! The Raiders are riding the wave of seven-game winning streak. Today they will play two more against Northwest University, who they swept in yesterday’s twin bill. First game begins at 11. #2 seed Southern Oregon University eliminated #4 seed IU Southeast and #1 seed William Carey today. Details here. They will now need to beat the #3 seed twice on Wednesday to make it to the 10-team NAIA Softball World Series for the first time. This Friday (2 and 4) and Saturday (11 and 1) will be your last chance to see the Raiders in Ashland. It won’t be the end of their season, however. They will likely end up as the #2 seed in the conference tournament, and should this weekend and the tournament go well, the 35-10 Raiders have an excellent chance to play in the NAIA World Series thereafter.